The Intra-CityU (SLW) Moot Committee strives to encourage, promote and nurture effective advocacy through organizing moot competitions for all law students regardless of experience, age or background. The Intra-CityU (SLW) Moot Competitions aim at providing a platform for students to put their legal knowledge into practical use and to develop the skills of a legal advocate. The objective is to build a mooting community whereby students develop through frequent exposure to mooting. 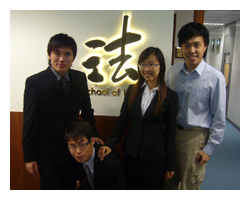 The Intra-CityU (SLW) Moot Committee was formed in the 2008/2009 academic year with Ada Yeung, Alex Ma, Mickey Yip and Sunny Chan as the founding members. Their affiliation with CityU’s international moot teams led to the idea of a student-run internal competition that would benefit all LLB and JD students. With the help and support from Professor Wang Guiguo (Dean of School of Law), Mr. Rajesh Sharma (Director of Mooting), Dr. Vernon Nase (Coach) and all the faculty members of the School of Law, the Committee was formed in December 2008 and began to organize a series of moot competitions. The Committee recognizes the importance of nurturing a culture which is conducive to the development of advocacy in addition to classroom hours. The first Intra-CityU (SLW) Moot Competition on Tort Law was successfully held in February 2009, with two preliminary rounds, and a semi-final and final round. In April 2009, the second moot competition on Contract Law attracted an even greater number of student mooters and faculty members to join in on the moot experience. As the organization of the competition expanded, the Committee also grew. In addition to the founding members, who were JD students, a number of LLB students and the Student Law Society also contributed to the running of the event. Together, they took a big step forward in building a strong mooting community in the School of Law. The Committee hopes that in the years to come the Intra-CityU (SLW) Moot Competitions will continue to serve the School of Law and its students in facilitating an enjoyable and fruitful moot experience.